In Arizona, greenbelts are a popular way to add an element of lushness to the stark desert landscape. However, because of the arid climate, the grass must be watered frequently by sprinklers in order to maintain its verdant appearance. Unfortunately, this sometimes leads to excess watering, causing fences and other objects surrounding the green spaces to rust. Rusted fences are particularly problematic when they enclose a residential property, such as an apartment or condo community. In addition to having an unsightly appearance that detracts from the property’s curb appeal, rusted fences are vulnerable to being broken or otherwise breached. This may threaten the residents’ safety, as intruders could more easily access the property. At DCS Industries, we provide fencing and gate solutions for various residential, commercial, and industrial properties around the Phoenix area. We often encounter situations in which a fence that borders a greenbelt becomes rusted due to exposure to sprinkler water. When this occurs, our team of professionals assesses the degree of deterioration and determines whether the fence may be repaired, or whether replacement is a better option. If the fencing needs to be replaced, DCS Industries always recommends wrought iron as a preferred material. Wrought iron has been admired for centuries due to its stylish aesthetic, and it may be easily customized to suit the appearance of any property. In addition, wrought iron is naturally durable, enabling it to withstand water from sprinklers and other threats, such as an intense sun, rain, and wind, better than other types of materials. However, particularly when wrought iron fencing borders a greenbelt, DCS Industries strongly suggests galvanization. Galvanization is the process of sealing the wrought iron with a zinc coating as an extra layer of protection against rust and other damage. All galvanized wrought iron products from DCS Industries carry a ten-year warranty, allowing property owners peace of mind that their investment will stay in prime condition for years to come. 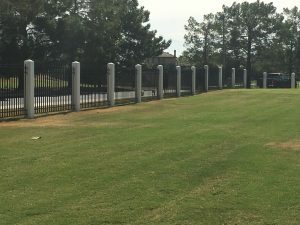 Whether your property’s fence borders a greenbelt and is rusting because of exposure to sprinkler water or you are simply looking for an elegant and durable way to enclose the property, the DCS Industries team can help you find the right solution for your needs. Contact us today at 623-825-7700 to request a free estimate!